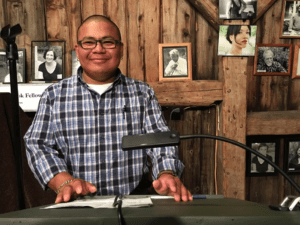 Gerardo Pacheco Matus is a Mayan Native and the recipient of a fellowship from CantoMundo, the Joseph Henry Jackson Award from The San Francisco Foundation and a Bread Loaf Writers' Conference Work-Study Scholarship. His poems and essays have appeared or are forthcoming from Black Lawrence Press, Grantmakers in the Arts, San Francisco Foundation, Amistad Howard-University, La Bloga Online Magazine, Poets Responding to SB1070, The University of Arizona Press, The Packinghouse Review, West Branch Wired and Four Way Review. The Haight Ashbury Literary Journal nominated Pacheco for a Pushcart Prize in 2015. His manuscript, Child of the Grasses, was a finalist for the 2016 Andrés Montaya Poetry Prize.